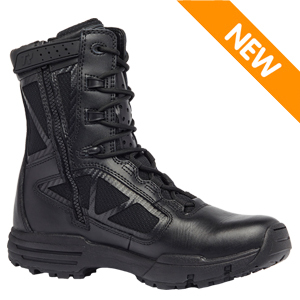 The Tactical Research Chrome series was designed as a high performance, comfort boot for law enforcement and security personnel. It features a side zipper for easy wear and removal for convenience. This boot is ideal for wet weather and outdoor operations and features a waterproof bootie that protects your feet from moisture yet maintains breatheability. Non-metallic construction makes this boot ideal around x-ray equipment and airport settings. This duty uniform boot polishes up nice for a professional appearance.